Ann gets it, I thought, settling down for an enjoyable read. First things first, even though the book is titled “Cookin’ Southern Vegetarian Style,” it is primarily a Southern vegan cookbook. Ann does use a little honey here and there, and occasionally lists ingredients like, “Parmesan or Soy Parmesan,” going on to note, “If you ever eat Parmesan, now is the time!” However, she also uses soy margarine, non-dairy milk, and homemade egg replacer, so the odd references to honey or optional cheese didn’t bother me. Out of all the Southern cookbooks I’ve read, this one has recipes closest to the kind of food I grew up eating. The kind of food my mama, daddy, aunts, and grandmothers cooked. Cornbread, Cornbread Dressing, Tater Tot Biscuits, Hoecakes, Hush Puppies, Overnight Cinnamon Rolls. Greens, Succotash (corn, tomatoes, and okra), Butter Beans, Corn Fritters, Corn Pudding, Okra, Red Rice, Grits. Fried Okra, Fried Green Tomatoes, Fried Apples. Chicken Fried Tofu (actually quite a few innovative tofu recipes imitating chicken, ham, and fish) and Sausage Balls. An assortment of gravies and sauces. Mincemeat Pie (despite the name, this pie hasn’t contained meat for several hundred years). Sweet Potato Pie. 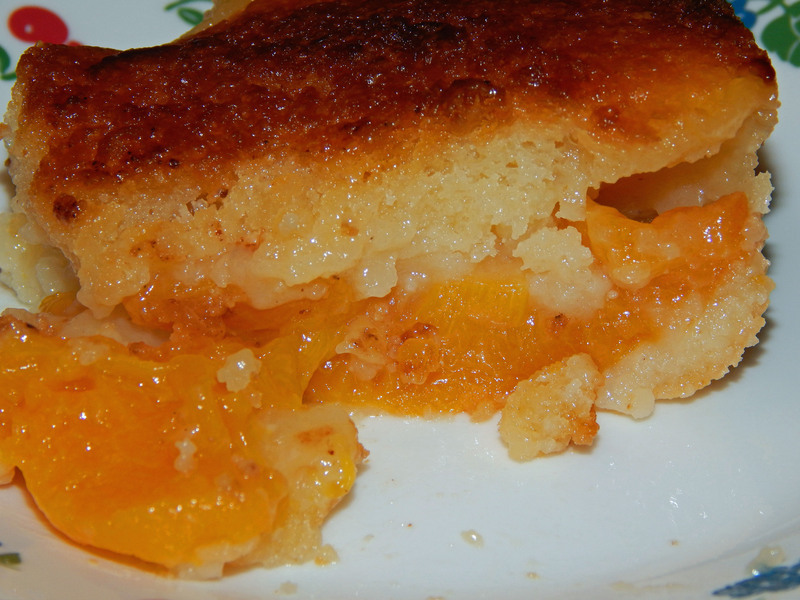 Peach Cobbler. Apple Crisp. And it had been a long, long time since I’d heard of Dump Cobblers, Knock You Naked (chocolate cake with caramels and chocolate chips), or Mini Ha Ha Cake (applesauce spice cake). The book is written in a sassy Southern style, and I laughed out loud a few times. Ann’s definitely someone that would be fun to have in the kitchen! Most recipes contain a little story or piece of advice. In fact, Ann liberally sprinkles advice throughout the book – from how to care for a cast-iron skillet, to how to make a cream soup without cream, to what to do if your ice tea gets cloudy. Some of her advice is really innovative – like using umeboshi plums, toasted sesame oil, or miso to replicate the taste of pork seasoning (aka “drippin’s” or “fatback”). There’s also a few lovely essays on topics ranging from Southern summer nights to her bowl collection to old-fashioned filling stations. As much as I enjoyed this book, it’s not without its (small) flaws. There are no photographs. This isn’t an issue for me, because I know what most of these recipes should like. But photos might be handy for someone unfamiliar with Southern cooking or Southern soul food. 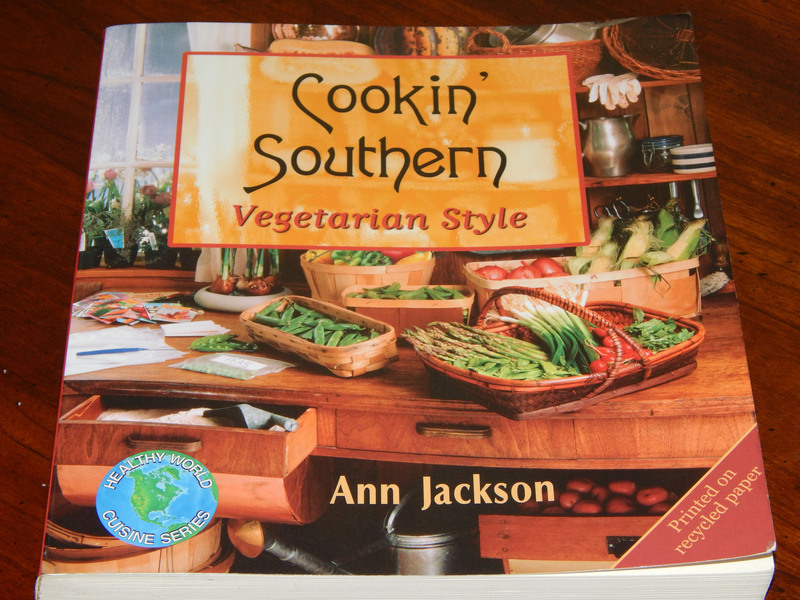 Is Cookin’ Southern Vegetarian Style the book for you? YES if you are Southern and nostalgic for the kind of food your mother, aunts, and grandmothers used to cook. MAYBE if you are not Southern, but have a fondness for the area, the food, or a particular Southerner or two. 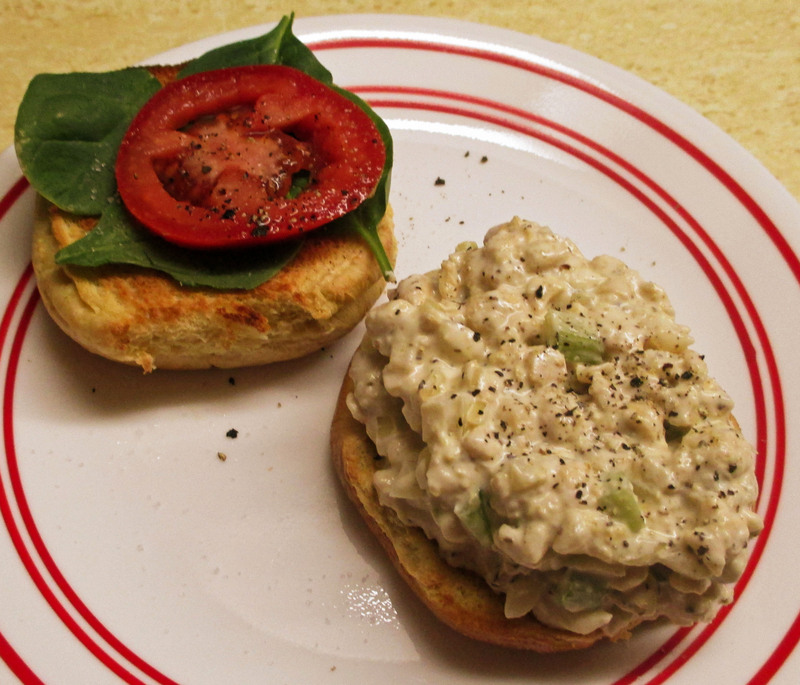 Or you are interested in widening your cooking repertoire with some easy veggie recipes. NO if you are expecting Paula Deen-type food. Or if you are prejudiced against the South – because this cookbook is about much more than food! GLUTEN-FREE PEOPLE: Although recipes are not marked as gluten-free, there does appear to be quite a few gluten-free recipes. This is because Southern food relies heavily on fresh vegetables, and rice instead of noodles. Most of the tofu recipes are gluten free (but be sure to use a gluten-free brand of tamari for seasoning). Of course, breads, baked goods, and some gravies would be off-limits. 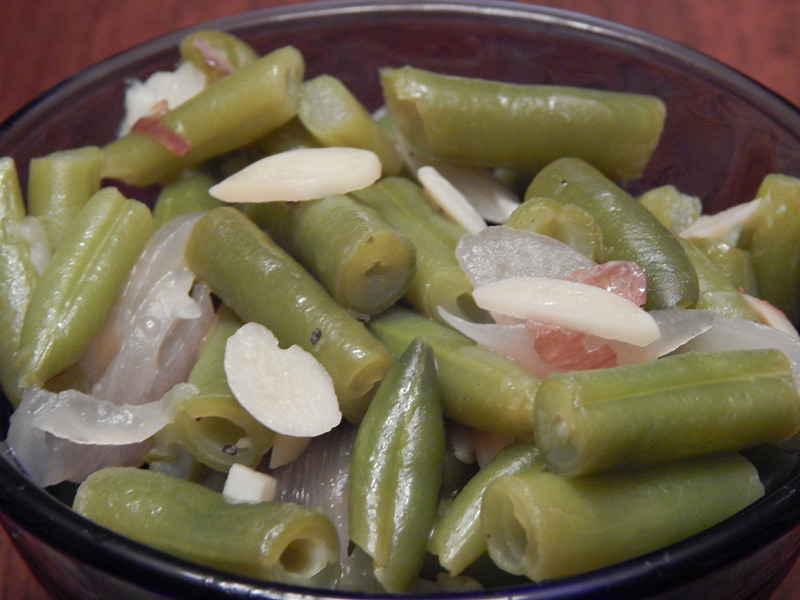 Ann and I have different ways of cooking green beans, but we both agree green beans should be cooked, not crunchy! Excellent review! I would love to take a look at this book. Although I do wish there were some pictures. Even though I’m from the South, it’s a different South, so I’m not familiar with some of these dishes. Nothing Google can’t fix though. Good point! I’m sure the food in Texas is quite different from the food in New Orleans … I believe Ann is from East Tennessee, which borders North Carolina. That could be why I was so familiar with many of her recipes and why her book resonated so strongly with me! Aha! That is a bit far from Texas. It all sounds great though. I’ve heard of Hoecakes, but I have never had one. I’ve never heard of Tommy Toe Salad, Knock You Naked, or Mini Ha Ha Cake. I’m intrigued and it sounds like I would enjoy her writing, as well. Cool … I’ll have to cruise over and check out that post! Thanks for the review. I don’t need another cookbook but this sounds like a good one.